I feel like my makeup look as of late has been getting more and more minimal. Whenever I would see people post "five product face" looks, I could never pare down my routine that far. 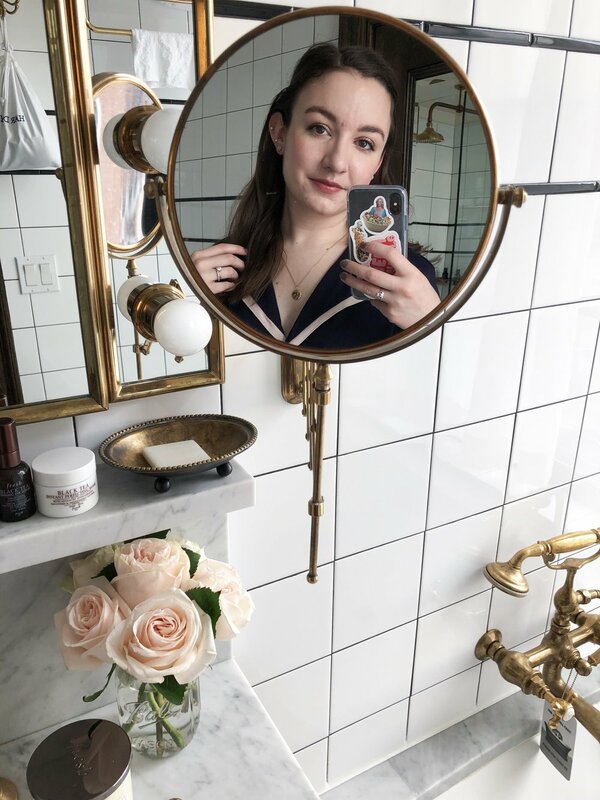 But lately I've been just using these five products to get a polished, pulled together, and minimal look in a flash - perfect for me because I've gotten into the habit of rolling out of bed only 10 minutes before I need to leave for work. I love the look of perfected, glowy skin, but on a rushed day I don't have time for layers of primer, foundation, concealer, and powder. Luckily my skin has been behaving lately, so a creamy concealer that works well on redness, blemishes, and undereyes is the perfect amount of coverage for me and the only base product I need. My favorite is the Glossier Stretch Concealer - it's basically the tinted moisturizer of concealers. It evens everything out while still looking like skin, and it makes you look glowing and healthy. I can't go anywhere without helping my brows out a little, and the Glossier Boy Brow is the most perfect all-in-one product for definition and hold. It gives me that fluffy, full brow look I'm always after without being crispy or crunchy. I don't even feel the need to use any pencils or pomades to fill my brows in - the Boy Brow does it perfectly. Another go-to product I can't go without is mascara. A little bit of mascara helps me look so much more awake. I haven't been able to shut up about the Wander Beauty Unlashed Volume & Curl Mascara lately, because it just might be the best one I've ever tried. I just recently bought a backup because I can't stand the thought of running out of it. It perfectly fans out my lashes and makes them ultra-fluttery. It keeps the curl all day long to keep me looking wide awake. If you're looking for a good everyday mascara, this is it. I know some people wouldn't include a highlighter when forced to choose only five products to use, but they're just a necessity to me. I like to make sure my skin looks dewy and glowing at all times, so I'm never without my Glossier Haloscope in Quartz. Real crystal extracts and a solid oil core add a dewy glow to the skin that doesn't feel sticky or tacky. I stripe it on directly from the stick and blend it out with my fingers - it's super easy and oh so pretty. Is this one cheating? I love to add a bit of color to my cheeks since I'm so pale - it really helps me look healthier and less like an extra from The Walking Dead. The Bite Beauty Multistick works well on both lips and cheeks, so it's a lipstick and blush in one here. It also performs well on the eyes if you'd want to use an eyeshadow, too. I've collected more of the Multisticks than one person probably needs, but my favorite of them all is Cashew. It's the perfect pinky brown that works on the eyes, lips, and cheeks. I use it underneath my cheekbones to add definition to my face, and I dab it on my lips for a soft, blotted color. The Multistick lasts such a long time, too. What five products would you choose for a five-product face? I mentioned a lot of Glossier in this post, and you can get 20% off your first order here! I do make a small commission on orders through my rep page, but that money gets invested back into this space on equipment and products to test!